Maurice Dando, popularly known as “Mick,” began in local football in his native Bristol and signed pro for Bristol Rovers in November 1928. In five years there he made only 18 appearances and moved on to York City in the summer of 1933. If this move represented a “last chance” for Dando at a football career, he responded to the opportunity by plundering 46 goals from 82 games before Chesterfield stepped in during the close season of 1935. Maurice thus came from York with a good reputation, but few were ready for the deluge of goals that came from him as the club swept to promotion in '35-6. His scoring record also brought a greater share of injuries, as opponents sought ever more desperate ways of stopping him. 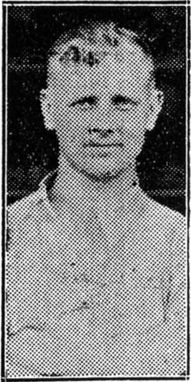 Niggling injuries may have been the first warnings of a much more serious problem, but by the time the Third (North) title was secured it became clear that he would never recover fitness enough to withstand life in the Second Division and he was allowed to move to Crewe in an unusual four-way exchange deal that saw Joe Taylor accompany Dando to Gresty Road, while Bert Swindells and Ernie Wright made the opposite journey. On paper, it looks as though Crewe saw the Spireites coming, for Swindells never made the first team and Wright played only once, yet Dando himself played only 16 times for the Alex before having to call time on his active football career. After the second world war Mick slipped into worsening ill-health. Bristol Rovers launched an appeal on his behalf in 1948 which raised £350 before his untimely death a year later, at the age of 43. For Chesterfield: 27 Football League appearances, 29 goals.